KJIPUKTUK (Halifax) - Used to be, if you weren't writing reviews for High Times or playing for Phish, smoking weed at work was something you did rather surreptitiously. Visine, chewing gum and pocket air freshener were all part of the undercover-stoner-at-work's disguise kit. Sure, you might get lucky and find yourself rolling joints over the noon hour with an accommodating boss, doing artistic hedge trimming in the summer sun for rich clientele. But such employment scenarios were more often than not the stuff of legend and lore, and, at least for myself, always seemed to fall in someone else's lap. People were getting high, sure, and pretending they weren't high at work. And maybe, the need to pretend you weren't high at work was the insurance policy against you getting REALLY HIGH at work. In industries where motor skills and cognitive abilities were understood to be at a premium, regimes of drug testings sprung up in an attempt to weed out illegal drug users, which, in turn, begat the 'beat-the-drug-test' industry. Nowadays, however, we live in interesting times. Medical authorization to access cannabis in Canada means that the social norms surrounding openly smoking marijuana – which certainly vary from region to region – are, if not coming unravelled, at least being brought more into question. More people are wandering around with legal marijuana, and, despite the myth of the 'lazy stoner', more of these people are likely showing up to their places of employment. The intersections between the 'straight' world of work and the 'stoned' world of work are multiplying and, as they meet, lots of questions are coming up. 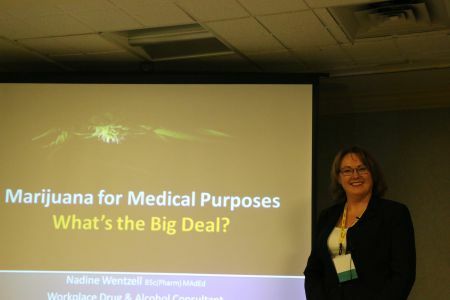 At the Workplace Health and Safety Conference at the World Trade and Convention Centre in Halifax, Nova Scotia, Nadine Wentzell, a pharmacist, a workplace drug and alcohol consultant, a former narcotics inspector with Health Canada and a drug investigative techniques teacher, does her best to clarify employer and employee responsibilities as they relate to medical marijuana. The conference show floor is packed with display booths offering the finest in flame retardant clothing, steel-toed boots, gas line monitoring and commercial water testing equipment; all indicators that there is a significant representations of tradespeople in the packed audience that gathers to hear Wentzell's presentation. As befits the venue, the crux of Wentzell's presentation focuses on workplace safety. Sadly, there is a certain 'reefer madness' vibe to the room, as Wentzell describes the various, potentially dangerous, ways that cannabis can impede a worker's abilities to function. The merits and dangers of cannabis are not on this day to be objectively compared to the merits and dangers of the pharmaceutical industry. Wentzell notes that cannabis can impair a worker's ability to think, to exercise, to judge and to be impulsive. Cannabis, she says, can also impair psychomotor skills (the relationship between cognition and motor skills), can impeded auditory and visual perception and can impair the ability to form memories. The risk of heart attack is four times greater within the first hour after smoking as well. Long-term, she say, cannabis use can impact short-term memory, judgement and motor skills. As well, she notes that there is a well-defined withdrawal process, with a potential aggressiveness that peaks within seven days, often accompanied by attitudinal problems. Perhaps most frightening of all, notes Wentzell, only ten percent of individuals are actually aware of marijuana's 'darker' side. I have no experience in operating heavy machinery while stoned. Generally, I felt quite accomplished if I could change a record while high. By now though, if I was a supervisor sitting in this presentation, I might be looking for ways to keep marijuana smokers, licence be damned, off of my work site. Wentzell also suggests that the majority of 'authorizations' provided by physicians in Canada are misdiagnosed, in that marijuana should be mainly considered for: “neuropathic pain that has failed to respond to other treatment.” Wentzell also notes other cases where marijuana is a suitable treatment, such as compassionate end-of-life care, in dealing with seizures related to multiple sclerosis, for example, or appetite stimulation. In short, there appears to be a distinct link between using medical marijuana, properly mind you, and knowing enough to excuse yourself from being part of the functioning, working, world. “If you're using medical marijuana properly, you're probably too sick to work,” notes Wentzell several times during the talk. While I understand that workplace safety as a whole, not just that of the medical marijuana user on the job site, is the issue of paramount importance, the presentation at this point risks going 'over the top'. 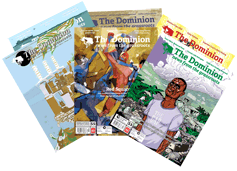 Wentzell summons the spectre of the Metron scaffolding disaster of 2009, when four construction workers in Toronto plunged thirteen stories to their deaths after a defective and hazardous swing stage collapsed. Three of the four workers, including the supervisor, had marijuana in their system at the time of death. Granted, this may well have impeded their judgment in terms of boarding a swing stage with only two safety harnesses, but to imply that they were killed by the boogie man marijuana is, in my mind, a certain disservice to a serious issue of workplace safety in general. None of the men killed in the Metron accident, to my knowledge, were licenced medical marijuana users. The presentation makes no mention of this, or of the defective swing. If one is to clump drug abusers in with licenced marijuana users, then workplace deaths caused by abuses of mainstream pharmaceuticals should at least be open to the same criticisms in the following breath. With the crowd now rightfully wondering what is to be done, Wentzell brings about the conclusion that this is a matter for workplace policy. This fine balance, between a worker's rights to equal treatment for a disability (generally embedded in provincial workers' rights statutes across Canada) and a mandate to protect worker safety on the job-site, is the harmony that must be struck. Workplace health and safety committees, notes Wentzell, are the places to develop proactive rather than reactive policies to deal with the issue of medical marijuana use at work. Of course, now that medical marijuana is a reality, people who use medical marijuana should be accorded all the rights of prescription drug users. Those who work with medical marijuana users should of course be accorded all the rights of a safe workplace. This is still new territory made no less easily navigable by Health Canada's lack of accompanying medical study work on marijuana. Without this work, experts on either side of the medical marijuana spectrum are thus free to cherry pick examples and cases that highlight their particular opinion. Suggesting that medical marijuana users have been misdiagnosed, to the point of needing a medical intervention from a better-informed physician, or that they are using a drug any more powerful or dangerous than an abused pharmaceutical, is not, in my mind, the most calm and practical way of leading genuinely inquisitive employers and employees towards the understanding that up-front policy is the means to deal with this issue at an institutional level. Im glad hearing such news. Submitted by ruzzelparker on Tue, 08/18/2015 - 10:49.